If you look at any poll or electoral prediction this year, you can see nearly every single person giving the same analysis: Democrats are going to lose big in November. How big is unclear at this point, but they are going to suffer in the US national election. Yet when you see what the Democratic Party leadership is doing, you don't get the impression this concerns them very much. Sure, President Obama is traveling around the country campaigning again, trying to get the left to vote, but there's no real sense of urgency or even panic at the impending disaster. A lot of people have theories why this might be true, from guessing that they're not as aware of what's about to happen as they ought to be to speculation that they have some big secret trick up their sleeve for October which they think will turn things around. Here's why they're not panicked. For two days the lack of Democrat panic about an upcoming electoral disaster has been mentioned on your show. Why would they panic? Let's look at this as a football game. The Republicans held the ball for 12 years. They slowly move down the field, they got to the red zone, failed to score a single touchdown. They just kicked a field goal from the five yard line. The Democrats, by comparison, when they got the ball, threw a Hail Mary on first down, scored a touchdown, made a two-point conversion, recovered the ensuing kickoff, had a successful onside kick, and now are throwing more touchdowns, three touchdowns and two-point conversions in about 90 seconds. The Republicans matriculated the ball for 12 years to a field goal, meaning Bush one and Bush two, but Obama in a year and a half has run the score up to 45-3, and the Republicans are already signaling when they get the ball back they don't think they can score, may play ball control again for a couple years. So why would the Democrats panic? They got a 45-3 lead, the Republicans are already saying, "Yeah, we're gonna get the ball back, but we're gonna just try to hold onto it for a little awhile." Being a baseball fan, I don't connect to this analogy that well but the point is well made: Democrats have had decades of almost continual success. Losing now doesn't really set them back too far, particularly with all they've managed to accomplish in less than two years. Over the enraged opposition of the American people, Democrats have managed to not just pass a health care bill which is designed to "Trojan horse" socialized medicine into the country, but they've essentially taken over two of the three biggest US car makers, virtually control the banking and finance sector of the nation, and have spent almost a trillion dollars on pet leftist projects. The executive department through various rulings and regulations is changing how business and agriculture functions in the nation, and the left effectively controls entertainment, popular culture, news reporting, education, and most of the judicial and legislative branches across the entire nation. With that in perspective, I can't help but think of the Friday the 13th movies. 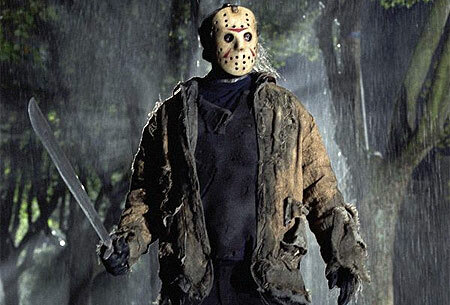 Sure, by the end of the movie Jason has been beaten down, drown, burned, hacked apart, or what have you, but by then he's killed dozens of people and you know he'll be getting back up. Democrats can rest knowing that whatever happens in this election, their time will come again. Democrats think they've won, this is just set to be a minor setback, a temporary frustration while they move ahead continuously and openly toward their goals of a more socialist nation with less liberty for individuals - for their own good - and greater government power. And based on past performance they can be fully confident that the Republican leadership will be slow, hapless, weak, easily scared, and tend instead of being truly opposed to the left's schemes merely cautious with them; doing the same thing, but slower and in smaller increments. After all, as the email writer says, the GOP had 12 years of control of one or both houses of congress and look what they managed to accomplish: a few tax cuts countered by the largest expansion of government since the 1960s, at least until President Obama was sworn into office. Democratic Party leaders have every reason to expect the Republicans to act the same way. Whatever their rhetoric when out of power, each time the party has actually gotten power - assuming that happens in November - they simply have not followed through on the promises of smaller government, cuts in spending, reduced deficits, and greater limitations on government power. Why should this time be different, the Democrats must presume. Will it be? That's up to the candidates who take office. They have a choice: follow through on how they were elected and the statements made while campaigning... or fall prey to the seductive power of the press, the pressures of the left, and the power and money of the office. Being a conservative in a sea of leftists takes a pretty strong set of convictions and willpower. Will these new congressmen have that, or will they - like the Newt Gingrich congress - melt away into the soup of Washington DC and become "moderates," abandoning what they campaigned on until its time to run for office once more? The truth is, it took the left a very long time to get us to the point we're at now in the United States. Its been an effort of almost a century, incrementally gaining small footholds and moving further, with a few steps back, and sometimes huge leaps forward (such as under FDR). It will take a long time to pull that back. What the Republicans do in congress will show very rapidly how they plan to behave and whether they have the courage and integrity to reverse this damage and return the nation to its roots and the intentions of the founding fathers. Despite desires of conservatives such as myself, the decades of corrosion of liberty and government expansion cannot be reversed in a few years. It will take decades of continual battle to get every single small gain for liberty and the dream of the United States which is now so close to being extinguished. Simply failing to expand government any more would be a tremendous gain at this point. Reversing the Reid-Pelosi tax increases due to take hold next year would be an important step. But small steps must be taken, and at every turn, without wavering, the Republican party must vigorously and steadfastly oppose the left's incremental theft of our liberty. To do so would be to the utmost dismay of the left in this nation. It would reverse the Republican Party's dismal record, encourage Americans that their politicians are listening and can do what they were elected to do as proper representatives, and it would stab a knife deep into the black hearts of leftist dreams. May it ever be so. This is an expanded form of a post that was on the Examiner Opinion Zone.